Mark the date! We aim to launch the Kickstarter on the 22nd of May, 24th of May, we’ll make sure to keep you up-to-date if anything changes and notify you at what time we will exactly go live. If you’re as excited as we are, then help us out and join our Thunderclap or spread the message to your fellow gamers. Now let me show you a bit of what we’ve been working on and check out the upcoming Kickstarter rewards we’re planning. We like to keep everything authentic, honest and transparent. That’s why we also like to do many things ourselves instead of spending it all out just to make it look extremely professional. We’d rather spend that kind of Ka-ching on the actual product and gaming community. So, when it came to the Kickstarter video we only spent money on renting a studio, camera equipment, and a camera-guy. The rest is all DIY, no actors, no stock footage, no friend-benefits, no marketing company etc. Just us, with an idea and a lot of willpower. Oh, and right now we’re busy with the video editing, ourselves. So, it doesn’t get any more real than that if you ask me. We’re excited!! When we started, we wanted to offer two optional items: a wrist pad and PBT or Double ABS keycaps. In the end, we decided that we’d include neither. The reason? It just didn’t feel right and it would add too much workload if we did it how we want it. I’ve received several wrist-pad samples ranging from foam to wood but it all felt too generic. We would rather make one ourselves with your feedback, instead of rushing one out just for the sake of it. The same counts for the keycaps. We went by Tai-Hao, but they didn’t offer any backlit compatible PBT or double ABS keycaps and weren’t as eager as we were to do something cool. Other keycap manufacturers we found only offered backlit double ABS keycaps with those horrifying “futuristic/gaming” legends. Not cool. Coming to the point that we decided to keep it to the core product. The Wooting one. Introduction: I’ve noticed that we’ve been a bit too shallow on explaining exactly what these Rewards mean and entail. So I’ve made everything a bit more clear and added some information. 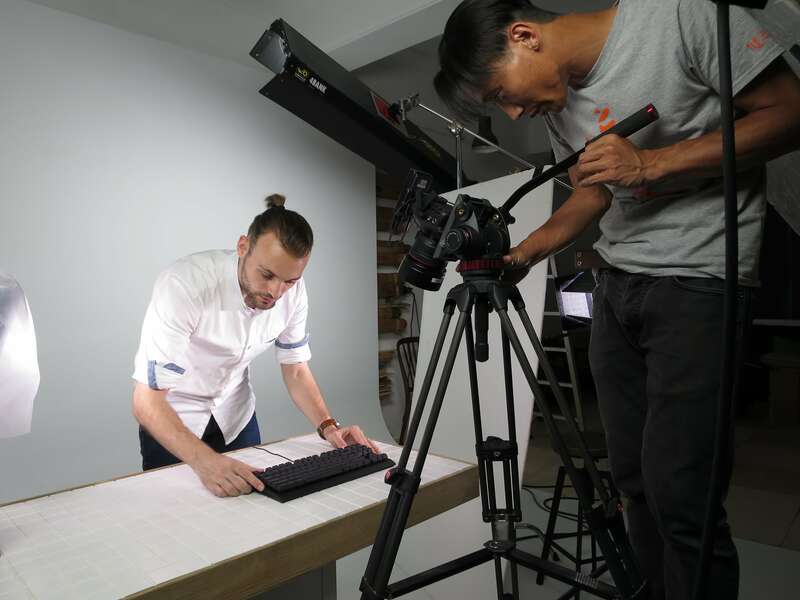 We’ve done our best to give the most competitive prices available, so that as many as possible people can start using an analog keyboard and we can work towards an industry standard. 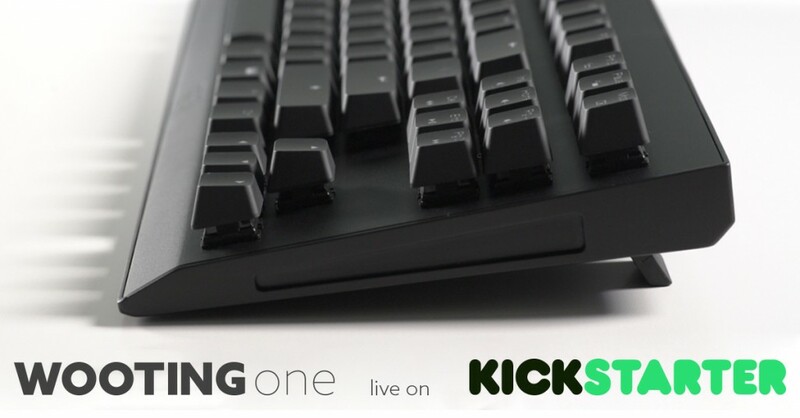 Your contribution isn’t only for an advanced keyboard, it’s also for our continued work in developing a better analog experience, upgrading your Wooting one keyboard with new analog features and build the pillars of which Wooting can continuously serve gamers with game changing ideas. Do you want Flaretech red or blue switch? If you choose Blue switch, the additional switches will be red and you’ll receive 2 extra blue switches. Everything saved on the keyboard, it’s software independent! Updatable Keyboard firmware (for new features) = our continued support & work on analog. Switch between Digital and Analog with the press of a button – called the Mode key. – 88x Opposite of KB switches. Exclusive Wooting T-shirt, specially made for sprinkle backers. Free shipping to EU countries and North America. You want Analog keyboards to happen but can’t commit yet. Follow the project and receive some Wooting love on delivery day. Fastest pledge around. You will probably be too late for this. You’re a fast one! 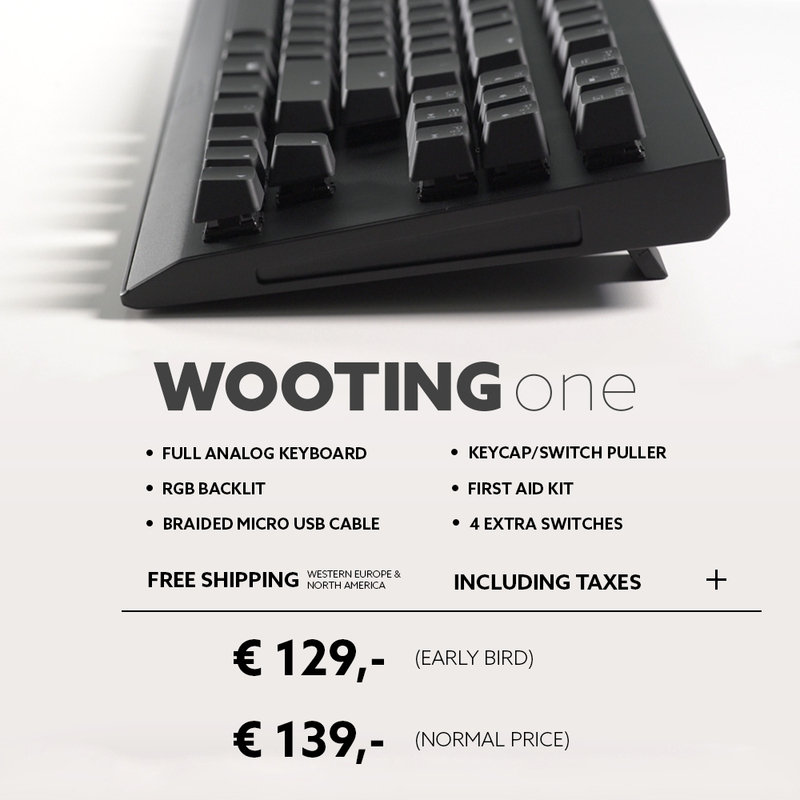 Grab your chance and get the Wooting one at a one-time limited price. 88x Opposite of KB switches. You are dedicated to the cause and want this to happen ASAP. EDIT: Added additional information about what is included in the price. Bit on the pricey side… What makes this keyboard for $175 cad better then the Blackwidow chroma $199 cad? The Blackwidow has more keys and is proven to be reliable by Razer, so what does wooing have to offer? Am I actually getting anything special for this price tag? Thank you for sharing your concern. As a result, we’ve updated the blog with more clear and entailing information. Awesome! There’s actually quite a lot happening on the Wooting one, and we’ve mostly been promoting that it has analog input for analog movement in games. But actually, that’s just scratching the surface, there’s a lot more hiding inside this smart keyboard and unlike other companies, we developed and are continuously developing the (updatable) firmware inside the keyboard. We always like to communicate in an honest and transparent way with open ears to feedback. Hopefully you can take another look at the blog, check out the video on http://www.wooting.nl and reconsider your evaluation. Quick question, are the Flaretech blue switches as loud as the Cherry MX blues? I like the idea of having a little tactile feedback but would prefer the keyboard to be relatively quiet. We’ll make a video typing with the blue and red switches during the KS, so it’s easier to make a choice afterwards. In my personal opinion, the Flaretech switch clicks two times, once on down press and once on up but it’s less audible and very dependent on the keyboard too. What I really like about the blue switch is that its press is so smooth and not scratch (you know what I mean?) during press down and I’m personally a big fan of the 55g force. As for the Red switch, it also has 55g and unlike the CherryMX, because of it’s heavier weight, you’re less likely to make typos, even without the feedback. But, that’s just my humble opinion. Looks good, I hope I am fast enough for the result bird. What will be the retail price? Will the packages ship from Netherlands? So in the EU we don’t have to pay any extra taxes? We’ll ship from out the Netherlands and USA. In both cases there are no shipping cost and additional taxes. * If you’re doing for the Dips pledge, then you really have to be fast. We honestly have no friends, acquaintances or others with “inside information” about the exact launch. It will literally be up for grabs when we go live. We’re really excited who’ll grab dips! Thanks, great to hear that you offer no taxes and free shipping. Often taxes and shipping for EU is so high that I get discouraged. I will try, but I am probably to late for Dips. No response on the retail price. Is it still a secret? Any plans to offer Pledge Add-Ons for example for different colored top plates or extra switches or will this be Premium Package exclusive for this campaign? We don’t want KS to feel like a cheaper pre-order shop It’s a place where we want to involve you with us as a founder of Analog keyboards. If the Kickstarter is a big success (=good quantity), then fellow gamrs can also reap the benefits at a later stage. If we don’t reach that quantity we have to settle with either less perks or higher price. So the KS is definitely the best opportunity. We wanted to avoid pledge add-ons to avoid complexity. That’s why we’ve made the premium package. The Switches and top-plates will not immediately be avaialable on the after-market, hence the extra exclusivity of the premium package. Yeah, that helped, thanks for the detailed answer. but without a clean way to make the mouse and the analogue “gamepad” work together, kinda like the steam controller (and it’s not that an undisputed success), it’s way too expensive for me sorry. Thank you for your feedback. I really appreciate the honest opinion. We’ve updated the blog with more clear and entailing information. Hopefully you will also consider that it’s not only an analog keyboard with a one-type-of-function. It’s also a groundbreaking mechanical keyboard in itself. Of course, it’s not for everybody but hopefully you can help support us and share it with others that might be interested. Great price, great rewards. Other commenters don’t seem familiar with mechanical keyboards outside of the Razer brand (please don’t compare the 2). Would I buy it? Yes, i’m a bit of a keyboard collector, it sounds original and useful, cherry stem support is what makes the sale for me here. If you aren’t familiar with any mechanical KB outside of Razer? You have a choice to either steer clear and stick with your branded mech, or take the plunge into the murky depths that is the world of mechanical keyboards. Really appreciate your comment here. Hopefully it will give a bit more insight for the people that are a bit unfamiliar with the mechanical keyboard world. Prize range seems to be in middle of the mechanical keyboards. I do not find that in anyway too high considering we are speaking about keyboard that has completely new and innovative switch solution. I’ve been using Ducky keyboards so far and now planning to go with Wooting when I’ll get one. Damn, cheaper than i thought it would be, i’ll try to buy the premium package :D. A little hard to save up the money though, trying to upgrade my gpu too. Hopefully going to buy both. That GTX 1080 is extremely tempting. I feel you! Agreed with others, this is innovative stuff, price is actually really good. Can’t wait for the kick starter. BTW this will be my first mechanical keyboard. Gotta have the best. Great to hear this. I’m extremely excited we’ll be making your first Mechanical Keyboard, you won’t regret it! Can´t wait to get my premium order in, been waiting for something like this for a long time, fantastic pricing great job and hope you have a great KS. the keycaps part is still a bit unclear for myself. In the top text you state, that you decided “to keep it to the core product” but in your spec table it says “MX-compatible keycaps”. So what are you actually including now? I should rephrase that, thank you for pointing it out. My meaning is that the stems of the switch are compatible with MX keycaps. Therefore, you can install any aftermarket keycaps on it. Is it possible to put Cherry MX switches or Gateron switches in the plate instead of the analog switches? I’d assume not because of different pinouts and stuff, but it would be awesome if it was actually possible. You can actually plug in CherryMX or Gateron switches in the plate, it just won’t do anything haha. The Flaretech switch is nearly identical to the MX shape but it doesn’t have any pins etc. because it’s optical. Thus, our PCB also has no soldering or anything directly connected to the switch. at first, I wanna ask you guys a colemak layout. turns out, it ships without keycaps. It comes with Keycaps, but not doubleshot or PBT. Just regular backlit keycaps that we made ourselves. So, for Colemak layout, you can use your existing MX- keycaps or you can swap them around. We will ship world-wide but Indonesia has added shipping cost. Ah, so it’s include the keycaps. Great! Do you have estimated shipping cost to Indonesia? It’s set on €30 at the moment. We’re trying our best to find better shipping methods for outside NA/EU, specifically Asia region, and will roll out any shipping cost savings directly to you. We don’t have a fulfillment partner in Australia and we’re probably going to send it from China in that case. The price for Australia is currently €30. We’re always on the lookout for any partner that would like to import and fulfill the keyboard in Australia, so it can reduce all the shipping cost and I’ll personally looking for other shipping options. The keyboard is awesome, inclusive RGB backlit. But it doesn’t have a numpad, so I won’t buy it, as I really need one… Hopefully you will still release one with a numpad! The more success we book now, the faster we can start on a numpad version but in either case it will take a while before it hits the market. Hopefully, you can still support us in any way possible even if it’s in the smallest way. Pinky love is important but I guess it’s a matter of what you’re already use to. Feel free to ask anything else. Thanks. Well, I guess you pretty much have my money on this one. A shame about the kickstarter release being delayed.